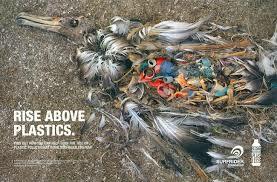 Simply put, plastic pollution is a killer. Checkout bags from the grocery store, foam foodware, single-use water bottles, cigarette butts and other plastics are are responsible for everything from ugly litter to the death of wildlife. There are many things you can do to reduce your plastic footprint. Below are a few, please visit RISE ABOVE PLASTICS to learn more. Buy your music/movies electronically. By purchasing electronically, you avoid the need to create plastic compact discs, plastic cases, and cellophane wrapping. Stop using plastic grocery bags. Each year, over one trillion plastic bags are used worldwide. Because these bags are so light and thin, they are easily carried by the wind out into the environment. Instead, use reusable bags to get your groceries and other purchases home. Recycle! In instances where you must use plastic, please make sure to recycle it.